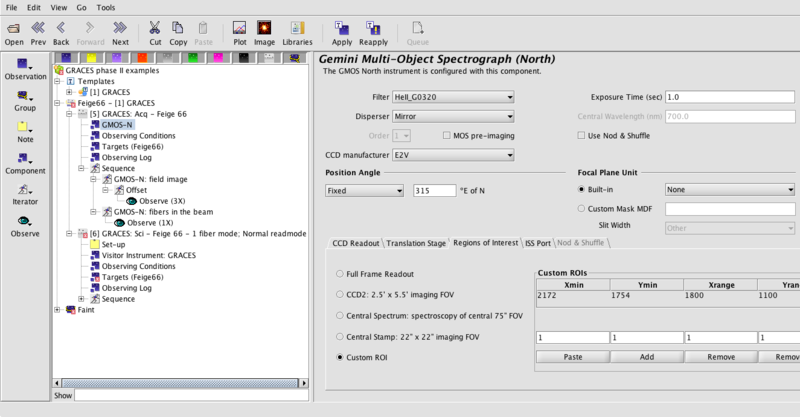 This page explains how to configure the Gemini Remote Access to CFHT ESPaDOnS Spectrograph (GRACES) in the Observing Tool. There is only a small number of steps to follow, as they consist on a first acquisition sequence using GMOS-N, followed by a Science sequence using the "Visitor Instrument" component containing all the details about the spectrograph set-up. The acquisition is executed using GMOS-N in imaging mode. The GMOS-N Static Component is used to set the filter, the exposure time for the field image (necessary to center the target on the fiber), the Position Angle and the filter. The narrow-band filters available for GRACES acquisition of bright targets are HeII, HeIIC, Hα and HαC. 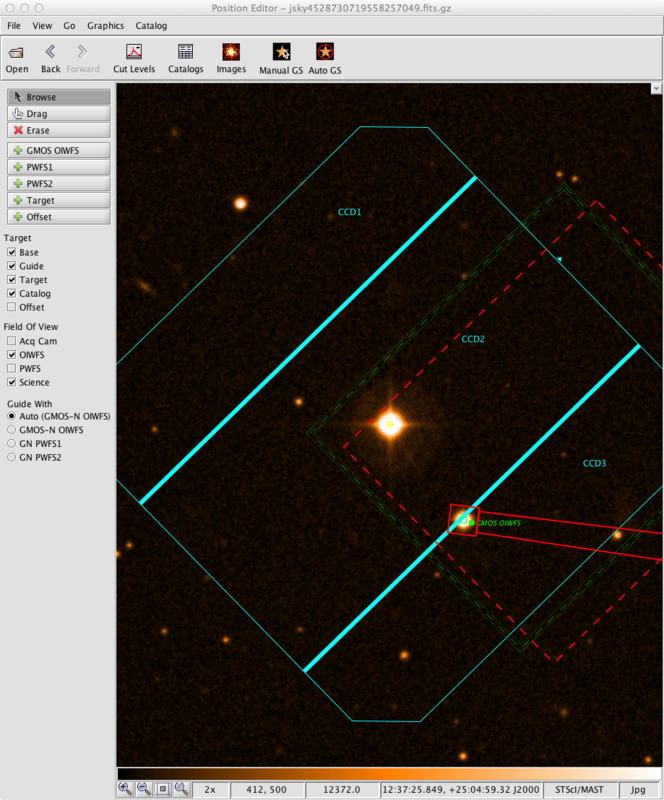 The broad-band filters available for GRACES acquisition of faint targets are g, r and i. It is necessary to keep the binning to 1x1 and strongly recommanded to use a Fast/Low gain readout. The Region Of Interest for reading the GMOS-N detector is set to Xmin = 2172, Ymin = 1754, Xrange = 1800, Yrange = 1110. The last step will be used to move the GRACES cassette into the beam. The central wavelength is defined by the user. This value is used to define which wavelength will the guiding be optimized for. One should expect the minimum light-loss due to atmospheric differential refraction to be achieved at that wavelenght. It is recommended to use the GMOS-N OIWFS for guiding. The periferal sensors can be used for non-siderial targets. Make sure the guide star is reachable by the wavefront sensor. 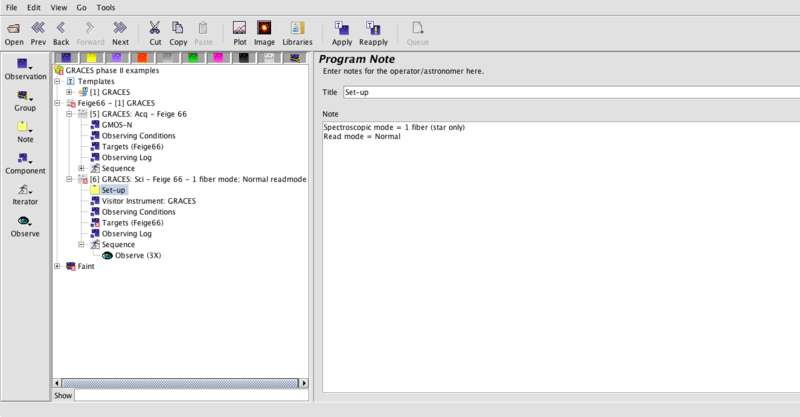 There is currently no specific instrument component for GRACES phaseII, and he science sequence is prepared using the "Visitor Instrument" static component. This component allows to set 4 parameters, but 2 of them, the Position Angle and the Central Wavelength, are already set in the acquisition sequence. The first one is the name of the instrument, which obviously is GRACES. 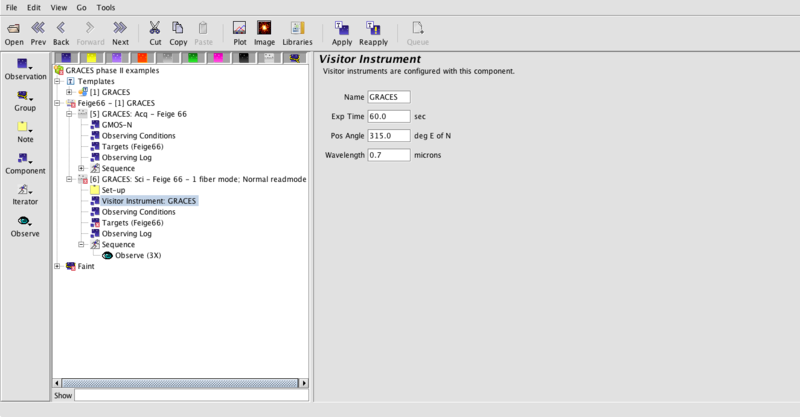 So the instrument sataic component is moslty useful to tell the observer what exposure time is resquested. The number of observation is determined under the Sequence Component. 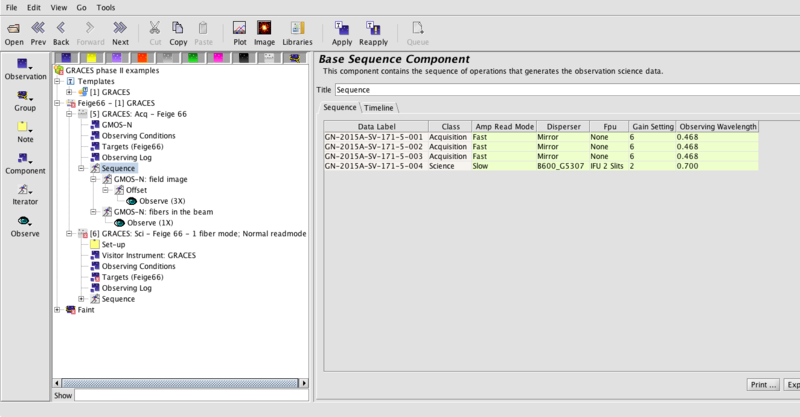 In the exemplae below, a 3 x 60s sequence is prepared.